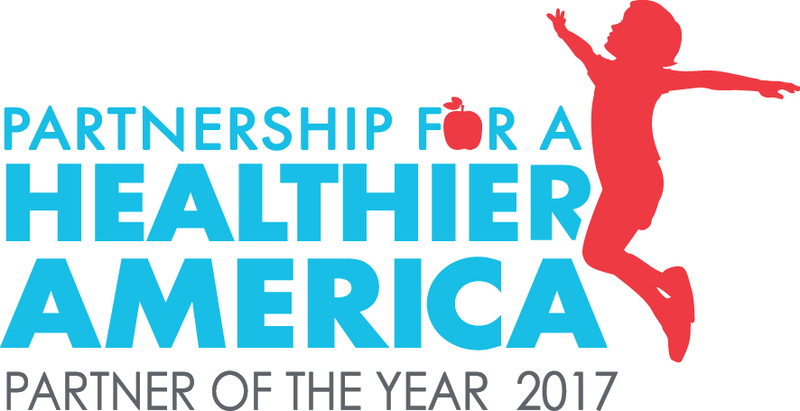 The Partnership for a Healthier America is honoring Learning Care Group, The Children’s Courtyard’s parent company, with the 2017 PHA Partner of the Year Award for the company’s extensive work in prioritizing healthier practices in the daily lives of young children. In 2014, Learning Care Group, a leading early education and childcare provider, reaffirmed its commitment to promoting healthy choices throughout its family of 900+ schools nationwide by making a commitment to PHA. Building on the momentum of its own internal Grow Fit healthy lifestyle initiative, Learning Care Group pledged to implement PHA standards aligning with the Let’s Move! Child Care goals for physical activity, food, beverages, infant feeding, screen time and parent engagement. Third-party verification shows Learning Care Group has successfully met or exceeded all of the PHA goals – paving the way for a lifetime of healthy habits for the thousands of children enrolled at its Childtime, Children’s Courtyard, Creative Kids Learning Center, Everbrook Academy, La Petite Academy, Montessori Unlimited and Tutor Time schools nationwide. The PHA Partner of the Year Award – part of the organization’s Catalyst for Change Awards – is presented to the partner who demonstrates how it is successfully executing key PHA strategies, including a keen focus on populations impacted by obesity; doing well while doing good; using an innovative approach to address childhood obesity; or creating a ripple effect within their industry. Learning Care Group was selected from a pool of over 200 eligible PHA partners. As Learning Care Group continues to further refine best practices for fitness and nutrition throughout its schools, its advancements are also driving meaningful changes among other early education providers. Learning Care Group has worked closely with its vendors to introduce healthier versions of child favorites such as chicken nuggets and cheese ravioli – new product offerings now also served by other childcare providers. Nutrition: Having already eliminated all fried foods and juice from the Grow Fit menu, Learning Care Group will now convert the remaining non-whole grain offerings to whole grain within the next year. It will also eliminate all grain-based desserts from the menu, further reducing consumption of sugar and saturated fats. Fitness: Leveraging its exclusive personalized curricular approach designed to ensure school readiness, the company is augmenting its fitness curriculum with new guided activities for indoor and outdoor play. Garden Program: In keeping with its emphasis on hands-on STEM and STEAM learning, the company is developing a new Grow Fit Gardening Program with scalable options for creating outdoor and indoor gardens at its schools. PHA will present the Partner of the Year Award at the “PHA Fit to Celebrate Gala” in Washington, D.C. on Nov. 1, 2017. Tickets are available for purchase at www.ahealthieramerica.org/gala. The Partnership for a Healthier America (PHA) is devoted to working with the private sector to ensure the health of our nation’s youth by solving the childhood obesity crisis. In 2010, PHA was created in conjunction with—but independent from—First Lady Michelle Obama’s Let’s Move! effort. PHA is a nonpartisan, nonprofit organization that is led by some of the nation’s most respected health and childhood obesity experts. PHA brings together public, private and nonprofit leaders to broker meaningful commitments and develop strategies to end childhood obesity. Most important, PHA ensures that commitments made are commitments kept by working with unbiased third parties to monitor and publicly report on the progress our partners are making. For more information about PHA, please visit www.ahealthieramerica.org and follow PHA on Twitter @PHAnews.